Light and fluffy, tart and sweet. It is a refreshing dessert that you don’t see around much anymore. 1. 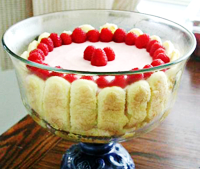 In a small bowl stir together the gelatin and 1/4 cup of the raspberry puree. Let the mixture sit for 5 minutes and then microwave for a few seconds to dissolve the gelatin. When the gelatin has dissolved, stir it into the remaining puree. Transfer the mixture into a larger bowl ontop of an ice bath. 2. Beat the cream until stiff peaks form, then fold it into the puree mixture (which is still resting over the ice bath). 3. Line your dish with the ladyfingers, adding your raspberry cream then another layer of ladyfingers, until you end with a smooth layer of the cream on top. Garnish with raspberries. Let it rest in the fridge for several hours. You can find more delicious recipes at my website, Divine Domesticity. Not Quite June Cleaver – Aprons, Pies and More!